1. Consider what you want to know first, then pick the best resource. 2. 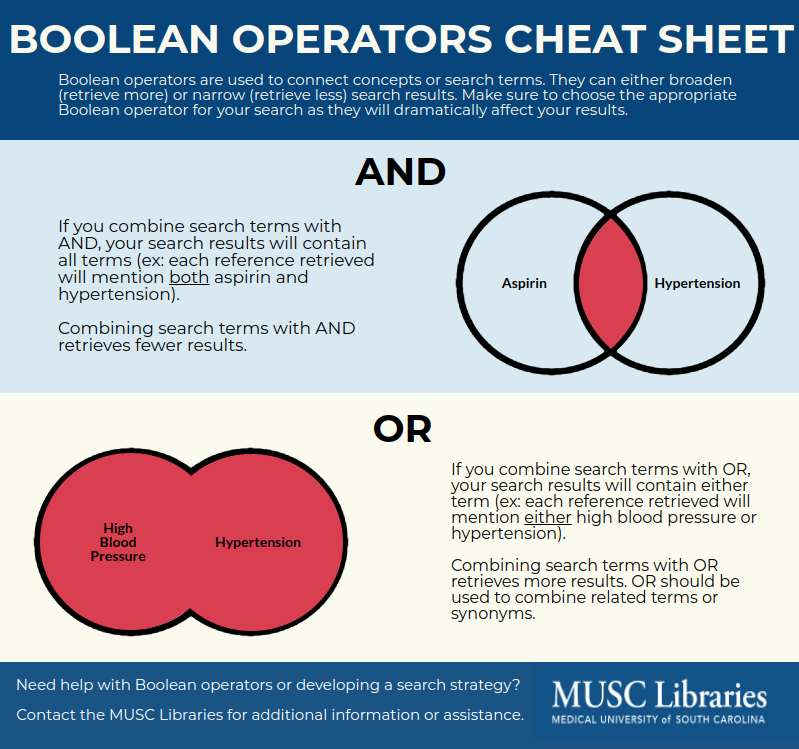 Break question down into individual concepts, search each separately, and then combine using the appropriate Boolean operators. 3. Use quotes to search phrases. 4. Find keywords on webpages faster by using keyboard shortcuts. Provides worldwide coverage of pharmaceutical science and health related literature. Coverage includes drug therapy, toxicity, and pharmacy practice, as well as legislation, regulation, technology, utilization, biopharmaceutics, education, economics, and ethics as related to pharmaceutical science and practice. A major biomedical database that provides links to the USC's journal collection. Citation data, journal impact metrics, and journal indexing. Includes all of MEDLINE and EMbase. A biomedical citation index. Available to South Carolina College of Pharmacy faculty and students. An index to allied health and nursing resources including pharmacy technicians. An online library of education research and information. Provides lists of journal articles and dissertations in psychology. **To download: On the CINAHL homepage, click on “iPhone and Android Apps” at very bottom. Enter MUSC email. An authentication key will be emailed to you. Download EBSCOhost app from Play/App Store. From mobile device, access email and click on link found in email to authenticate the app. In the app, go to Settings and select only “CINAHL Plus with Full-Text”. Dietary Supplement subset of the PubMed database. Randomized Controlled Trial is a prospective, analytical, experimental study using primary data generated in the clinical environment. Individuals similar at the beginning are randomly allocated to two or more groups (treatment and control) then followed to determine the outcome of the intervention. Cohort Study (prospective) is a study of a group of individuals, some of whom are exposed to a variable of interest (e.g., drug or environmental exposure), in which participants are followed up over time to determine who develops the outcome of interest and whether the outcome is associated with the exposure. Cohort Study (retrospective) is when data is gathered for a cohort that was formed sometime in the past. Exposures and outcomes have already occurred at the start of the study. You are studying the risk factor and see if you can associate a disease to it. Individuals split by exposure. Case Control Study is a study in which patients who already have a specific condition or outcome are compared with people who do not. Researchers look back in time (retrospective) to identify possible exposures. They often rely on medical records and patient recall for data collection. Individuals split by disease. Survey Study is an epidemiologic study that produces survey results, and will consist of simultaneous assessments of the health outcome, primary risk exposure and potential confounders and effect modifiers. Two types of survey research are cross-sectional and longitudinal studies. Cross-Sectional Study is the observation of a defined population at a single point in time or during a specific time interval to examine associations between the outcomes and exposure to interventions. Exposure and outcome are determined simultaneously. Often rely on data originally collected for other purposes. Longitudinal Study follow subjects over time with continuous or repeated monitoring of risk factors or health outcomes, or both. Researchers conduct several observations of the same subjects over a period of time, sometimes lasting many years. Before and After Study is a study in in which observations are made before (pre) and after (post) the implementation of an intervention, both in a group that receives the intervention and in a control group that does not. Case Series and Case Reports are descriptive study/studies that consist of collections of reports on the treatment of individual patients or a report on a single patient. Systematic Review usually focuses on a specific clinical question and conducts an extensive literature search to identify studies with sound methodology. The studies are reviewed, assessed, and the results summarized according to pre-determined criteria of the review question. Meta-Analysis takes a systematic review one step further by combining all the results using accepted statistical methodology.